Thrive is a therapeutic approach to help support children with their emotional and social development. It is a whole school approach based around, current studies of effective learning and current models of child development – in order to help the school to understand the needs being signalled by children’s behaviour. 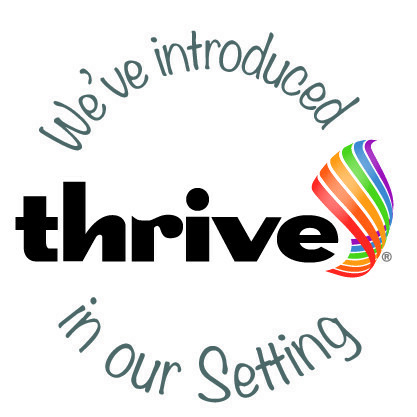 The Thrive approach offers practical strategies and techniques and is built around online assessments which identify children’s emotional development and provides action plans for their individual needs. Whole classes can also use Thrive techniques and activities to address any issues or as part of PSHE sessions in school. Thrive promotes their emotional and social growth by building positive relationships between a child, their peers and the teaching staff and helps them explore and understand their feelings through various activities. For more information about the Thrive approach see the website: www.thriveapproach.co.uk or contact Mrs D Younger and Mrs M Anderson Thrive Practitioners at Redesdale Primary School on 0191 200 7326.